MIT’s new Kendall Square office building will also be home to a new school museum in the lobby. One of the biggest names in aerospace is coming to the Massachusetts Institute of Technology’s front door. 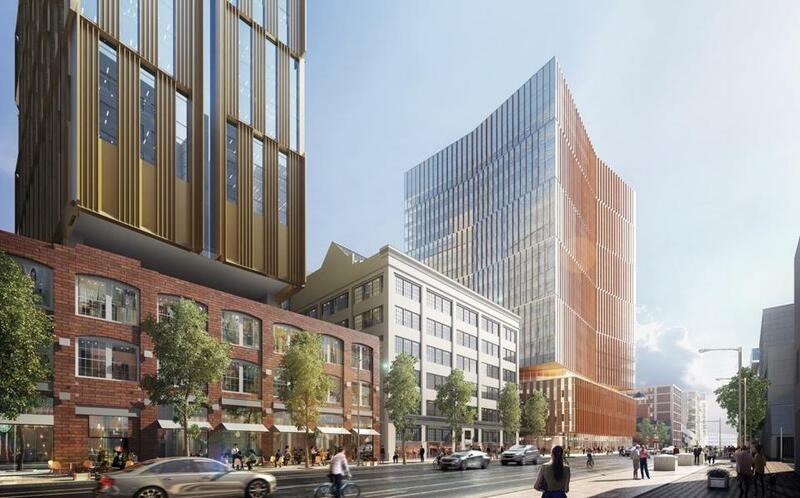 Boeing Co. has agreed to lease about 100,000 square feet in a new office building MIT is planning next to the MBTA station on Main Street in Kendall Square. It will be the local home of the company’s newly purchased subsidiary, Aurora Flight Sciences — which develops technology for unmanned aircraft — and serve as a new Aerospace and Autonomy Center for the plane manufacturer. The deal makes Boeing the latest big name to come to Cambridge’s Kendall Square, where tech and life sciences companies have in recent years flocked to fill new buildings. It also reflects a growing interplay between MIT and the companies doing business near it. Boeing will occupy about one-third of a 343,000-square-foot office building MIT has planned for the site. It’s one of six buildings — including office space, market-rate housing, and a graduate student dorm — that the university is planning along Main Street. It envisions a $2 billion “Kendall Square Initiative” as a new “gateway to campus, and a way to help researchers at the university connect with, and contribute to, companies nearby. It makes sense for Boeing to be the first tenant, said Steve Marsh, managing director of MIT’s real estate group. The company has long had a research relationship with the school, and earlier this year said it will serve as lead donor for a new $18 million wind tunnel on campus. Last fall, Boeing acquired Aurora, to tap its expertise in unmanned and autonomous flight. The Virginia-based Aurora works on adapting technology that is used to help fly small drones, for use in larger commercial and military aircraft, said company chief executive John Langford. Langford and other Aurora cofounders are MIT grads, and the company opened a small research center in Kendall in 2005. Today, it employs 140 people in Cambridge, a figure that has doubled over the last year since the Boeing acquisition. The new space will give it room for 300 employees, Langford said, as demand for, and interest in, autonomous flight continues to grow. While Kendall is not known as an aerospace hub, it’s still a good place to expand, Langford said. The building that will house Boeing also will be home to a new MIT Museum in the lobby. The university is negotiating with other companies for the rest of the space, said Marsh. Construction is expected to start in the fall, and the building is scheduled to open in 2020.